This article is about the muscle. For the band, see Heart (band). The heart is an organ found in every vertebrate on the left side of the body in humans. It is a very strong muscle that is about the size of a fist. It pumps blood throughout the body. It has regular contractions, or when the heart squeezes the blood out into other parts of the body. Cardiac and cardio both mean "about the heart", so if something has the prefix cardio or cardiac, it has something to do with the heart. Myocardium means the heart muscle: 'myo' is from the Greek word for muscle - 'mys', cardium is from the Greek word for heart - 'kardia'. The human heart has four chambers or closed spaces. Some animals have only two or three chambers. Heart structure: Arrows show the direction of blood flow. In humans, the four chambers are two atria and two ventricles. Atria is talking about two chambers; atrium is talking about one chamber. There is a right atrium and right ventricle. These get blood that comes to the heart. They pump this blood to the lungs. In the lungs blood picks up oxygen and drops carbon dioxide. Blood from the lungs goes to the left atrium and ventricle. The left atrium and ventricle send the blood out to the body. The left ventricle works six times harder than the right ventricle because it carries oxygenated blood.. Blood is carried in blood vessels. These are arteries and veins. Blood going to the heart is carried in veins. Blood going away from the heart is carried in arteries. The main artery going out of the right ventricle is the pulmonary artery. (Pulmonary means about lungs.) The main artery going out of the left ventricle is the aorta. The veins going into the right atrium are the superior vena cava and inferior vena cava. These bring blood from the body to the right heart. The veins going into the left atrium are the pulmonary veins. These bring blood from the lungs to the left heart. When the blood goes from the atria to the ventricles it goes through heart valves. When blood goes out of the ventricles it goes through valves. The valves make sure that blood only goes one way in or out. The heart has three layers. The outer covering is the pericardium. This is a tough sack that surrounds the heart. The middle layer is the myocardium. This is the heart muscle. The inner layer is the endocardium. This is the thin smooth lining of the chambers of the heart. A heart beat is when the heart muscle contracts. This means the heart pushes in and this makes the chambers smaller. This pushes blood out of the heart and into the blood vessels. After the heart contracts and pushes in, the muscle relaxes or stops pushing in. The chambers get bigger and blood coming back to the heart fills them. The order is: atrial systole → ventricular systole → cardiac diastole. When this happens one time, it is called a cardiac cycle. Systole (when the heart squeezes) happens because the muscle cells of the heart gets smaller in size. When they get smaller we also say they contract. Electricity going through the heart makes the cells contract. The electricity starts in the sino-atrial node (acronym SA Node) The SA Node is a group of cells in the right atria. These cells start an electrical impulse. This electrical impulse sets the rate and timing at which all cardiac muscle cells contract. This motion is called 'atrial systole'. Once electrical impulse goes through the atrio-ventricular node (AV Node). The AV Node makes the impulse slow down. Slowing down makes the electrical impulses get to the ventricles later. That is what makes the ventricular systole occur after atrial systole, and lets all the blood leave the atria before ventricle contracts (meaning squeeze). After the electrical impulse goes through the AV Node, the electrical impulse will go through the conduction system of the ventricle. Conduction means heat or electricity traveling through something. This brings the electrical impulse to the ventricles. The first part of the conduction system is the bundle of His. His is named for the doctor (Wilhelm His, Jr) who discovered it. Bundle means strings or wires grouped together in parallel. Once the bundle (meaning a group of strings or wires going in parallel directions) goes through the ventricle muscle, it divides into two bundle branches, the left bundle branch and the right bundle branch. The left bundle branch travels to the left ventricle and the right bundle branch travels to the right ventricle. At the end of the bundle branches, the electrical impulse goes into the ventricular muscle through the Purkinje Fibers. This is what makes ventricle contraction take place and makes ventricular systole. ECG is an acronym for ElectroCardioGram. It is also written EKG for ElectroKardioGram in German. The ECG shows what the electricity in the heart is doing. An ECG is done by putting electrodes on a person's skin. The electrodes see the electricity going through the heart. This is written on paper by a machine. This writing on the paper is the ECG. The ECG shows atrial systole. This is called a P-wave. Then ventricular systole happens. This is called the QRS or QRS-complex. It is called a complex because there are three different waves in it. The Q-wave, R-wave, and S-wave. Then the ECG shows ventricular diastole. This is called the T-wave. Atrial diastole happens then too. But it is not seen separate from ventricular diastole. The PR-Interval is the space between atrial systole (P) and ventricular systole (QRS). The QT-Interval is from when the QRS starts to when the T ends. The ST-segment is the space between the QRS and T.
↑ Phibbs, Brendan (2007). The human heart: a basic guide to heart disease (2nd ed.). Philadelphia: Lippincott Williams & Wilkins. p. 1. ISBN 9780781767774. ↑ Betts, J. Gordon (2013). Anatomy & physiology. ISBN 1938168135. Retrieved 11 August 2014. 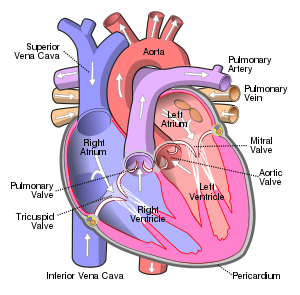 Wikimedia Commons has media related to Heart (organ). This page was last changed on 23 April 2019, at 08:40.